Let's Get Rid of That Turkey Neck! Turkey neck. Sagging neck. Sagging or droopy jaw line…………..…Whatever you want to call it – most of us don't like it! And, what’s worse, you can’t fix it with makeup, you can’t hide it, and there are no quick non-surgical procedures. 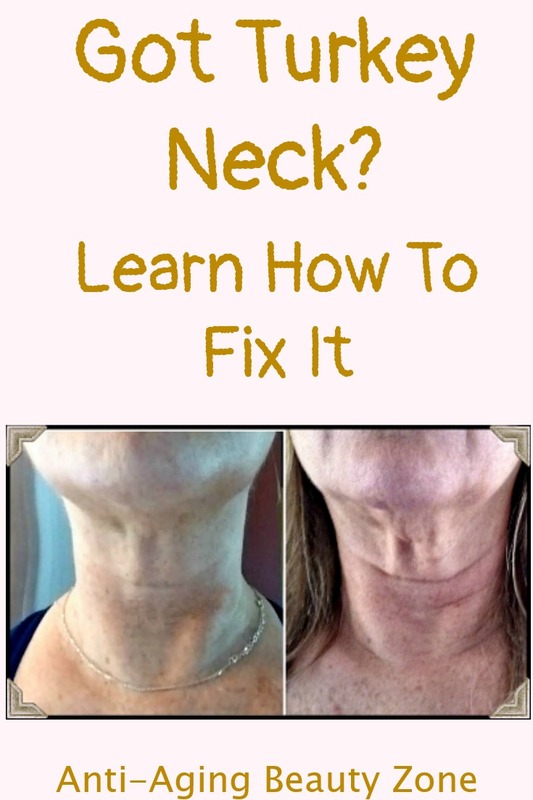 BUT, there is a natural way to improve the look of a droopy, sagging neck. First, it's important understand that when you're trying to firm up the neck skin - you really have to address the whole face/neck first and create a solid foundation first. Why? Because the facial muscles from your scalp to your upper chest are interconnected. For example, did you know that certain jowl and neck exercises can also help firm sagging nasolabial folds and some exercises can even help lift hooded, puffy eyelids! Who knew? Click here to see which one BIG muscle is mostly responsible for that sagging neck and droopy jowls and what you can do about it. Also, take a look at this interactive facial muscle chart and check out how the platysma muscle is responsible for the lower part of your face. You'd be surprised how one group of muscles actually help lift and firm other surrounding areas of the face and neck. Not too long ago, I embarked on a “Jowl Lifting - Neck Firming” challenge and I want to share my results with everyone. My goal is to get rid of - or at least firm up - that turkey neck wattle that seemed to have developed overnight! First thing - I got into the habit of performing a complete facial exercise program on a steady weekly basis. Later, I added a few bonus exercises to target the lower part of my face and especially the sagging neck area. 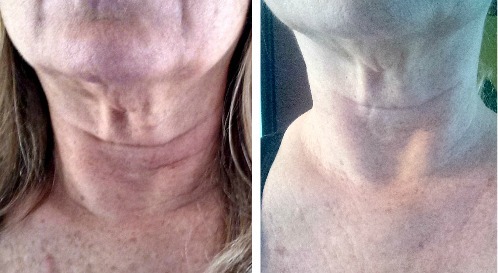 Check out my neck firming results after only 8 weeks! Exercises for the neck only? After seeing my results posted on this page, many women asked for specific neck exercises to help fix a sagging or wrinkled neck. Basically, they wanted to just "spot train" a certain area and forget the whole face workout. But this is a bad idea for several reasons. First - Regardless of what area of the face bothers you today - as you age - other areas will begin to show signs of aging too. As Deborah Crowely, creator of FlexEffect Facial Resistance Training states, "You may want to put emphasis on an area that concerns you, but do refrain from spot building (targeting an area exclusively). In time all areas will concern you." Second - Since the muscles of the face and neck are interconnected, spot training - at the very least is not effective. At the very worse you risk the chance of looking imbalanced or overbuilt. Why spot training turkey neck exercises alone won't work? Unlike the muscles of the body which are attached to bone, the facial muscle’s network is different because facial muscles are attached to bone, to other facial muscles and even to the skin. The fact that some facial muscles terminate directly into the skin is one reason why regular facial exercisers have smoother, firmer looking skin. If you do a complete facial workout (all 57 muscles) on a regular basis, you can add a few "bonus exercises" for your specific troubled areas. Carolyn, the creator of CFF workout program suggested the Lower Face Lift routine and Neck Brush to eliminate neck wrinkles and firm my lower face. The workouts only take 15 minutes, 3 times a week. And the extra bonus exercises add only about another minute or two to my schedule. Simple! The hardest part was creating a habit of doing face exercises on a weekly schedule. But once I saw the changes taking place around my eyes and cheeks, I got so excited and inspired to keep doing them week in and week out. The changes in the upper part of the face is a small sign that things are moving along. For many people, the cheek and eyes are usually the fastest and first to respond to face exercises. 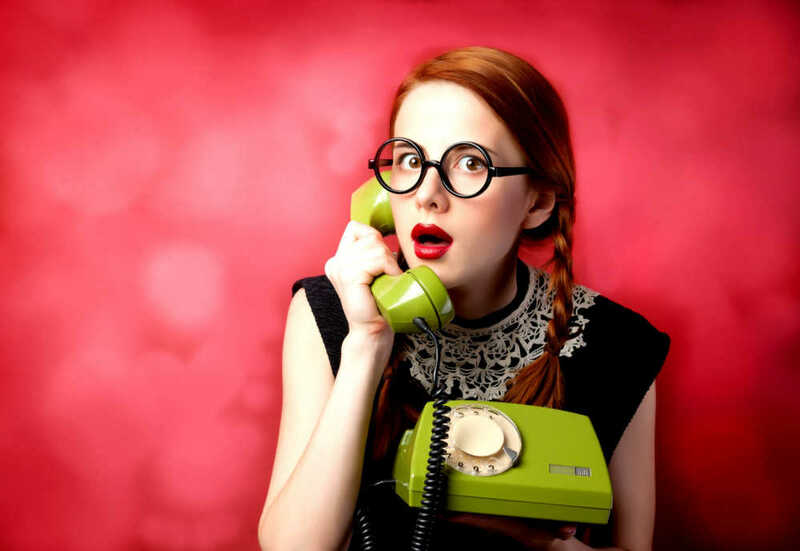 The jawline and neck area are usually the slowest to respond. But it is possible and I’m proof that it does work. You can also see a lot of impressive before and after pictures if you Visit Carolyn’s Facial Fitness site. In addition to before and after pictures, you'll find free facial exercises to try out. Carolyn also explains - in great detail - how and why her facial exercise program is one of the best around that offers smooth and balanced results. And, make sure to bookmark this page or the Anti-Aging Beauty Zone website to see my progress. See you in a few weeks when I post my pictures and track my "turkey neck" progress.…………..
Click here to see before and after pictures of my neck after using vitamin C to firm up skin and reduce brown spots. CROWLEY, D., ed. The FlexEffect, Facial Resistance Training. FlexEffect Publishing Eureka, CA. 1998,1999.